The winner of Blue Skies Tomorrow by Sarah Sundin is Karen K. Karen has been notified by email. Why do you write the kind of books you do? Well, my passion is crime fiction. I love to read suspense novels, murder mysteries, detective novels and also write them. I'm intrigued with the struggle between good and evil that presents itself in most novels in this genre. Besides when you came to know the Lord, what is the happiest day in your life? Oh, that would be my wedding day. In fact we're coming up on our 25th wedding anniversary in a few months. Somehow it doesn't seem that long. How has being published changed your life? I'm so newly published that I really don't know yet how it's changed things. I know I'm a lot busier. What is your current work in progress? I'm finishing the sequel to BURNING HEARTS. The second in the Sanctuary Point series is GOODBYE NOEL. It's a suspense set during the 1947 Christmas/New Year season. My research revealed how Christmas celebrations and symbols were part of the warp and woof of American life in that time period. What would be your dream vacation? Driving down the West Coast Highway (runs along the coastline of Washington, Oregon, and California) alternating Christian rock and country western blaring on the car radio - window open. It takes about three days. I've done it and it was great. The Pacific Ocean is incredible, not to mention the beautiful redwoods. How do you choose your settings for each book? I chose settings that I know. I know the south shore of Long Island and relish the time I've spent there. I created the fictitious village of Sanctuary Point for this series. All the other towns and landmarks mentioned in the novel are real locations on Long Island, NY. If you could spend an evening with one person who is currently alive, who would it be and why? I guess it would be Laura Bush. I've always admired her quiet grace. I think the country benefitted from the work she's done on behalf of literacy in America. What three things about you would surprise readers? 1. I'm a lot more ditzy than people think I am. 2) I was an independent animal rescuer for a good number of years. I've rescued about 40 dogs and cats and found them homes. 3) My idea spot on earth would be in the tropics under a cabana with a good book as the surf comes in and goes out. What are your hobbies, besides writing and reading? Cooking and eating. I'm a foodie. I'm constantly searching the Food Network site for recipes. I'm also enthusiastic about container planting every summer. This year I put in beefsteak tomatoes, cherry tomatoes, yellow summer squash, basil, and strawberries. I also love the rose bushes I planted last year in our backyard. What are you reading right now? REVENGE by Mark Young. This is a book with tons of twists and turns. Don't expect the contract to come overnight. Just about every contracted author I know wrote seriously for three to five years before selling a book. If a free online writing course is available, take it. I took the Harlequin free online course and it was invaluable. I've taken two Romance Writers of America (RWA) workshops since then geared toward mystery writers that were not free. Join a writers group. American Christian Fiction Writers (ACFW) is perhaps the largest and offers the most to the new Christian fiction writer. If the new writer feels his/her writing might be gritty or seat of the pants, join Edgy Christian Fiction Lovers (Ning). There are many local and regional groups as well. Mostly, get active in these groups and take full advantage of what they offer. Is there anything interesting about this book that you want us to know? There's quite a bit of humor in it. What one question would you like us to ask your readers? Of the four, which is your favorite, murder mysteries, detective novels, thrillers, or romantic suspense? And why? 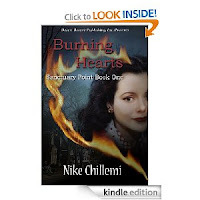 Nike Chillemi has been called a crime fictionista due to her passion for crime fiction. She is a member of American Christian Fiction Writers (ACFW) and the Edgy Christian Fiction Lovers (Ning). She was an Inspy Awards 2010 judge in the Suspense/Thriller/Mystery category and a judge in the 2011 Carol Awards in the suspense, mystery, and romantic suspense categories. She is the founding board member of the Grace Awards, a reader's choice awards for excellence in Christian fiction. She writes monthly book reviews for The Christian Pulse online magazine. BURNING HEARTS is the first book in the crime wave that is sweeping the south shore of Long Island in The Sanctuary Point series, published by Desert Breeze. •Elementary School – Will he make a friend? Will he eat all his lunch, or just the cookies and chips? God help him to love You with all his heart. •Junior/Senior High –Will he make the right friends? Is he paying attention to the teacher? God, help him love You with all his soul. •College - Will he make some forever friends? Is he making the right life decisions? God, help him to love You with all his strength. •To pray over our children no matter where they are in life. •To be on our knees for those God entrusted to us. •To ultimately pray for each child to love Jesus with all his heart, soul, and mind! •Finally, to let them know we are praying for them each day! What a blessing it is to pray for our children. Men admire men who can play hurt, who can finish the game even when injured, sick, or falling apart. So, why, when it comes to marriage are we so quick to throw in the towel? PLAYING HURT is a ‘playbook’ that will use biblical principles for marriage that will challenge you to push forward even when your wife hurls an insult, hurts your pride, or disrespects you. It combines Scripture, questions at the end of each chapter, and stories from his own marriage. PLAYING HURT is written for men who speak the language of sports better than they speak the language of love. It uses sports to teach the lessons, then back the lessons learned up with Scripture and questions for you to consider as you finish each chapter. This is a book to take slowly, to read and consider each point, before trying to move on to the next. As soon as you get the first “play” down, you can learn the next. An excellent resource for most men, the ones who understand sports. $11.99. 152 pages. Brian Goins is the author or editor of numerous study guides, workbooks, and Bible studies that he has developed for Insight for Living (Chuck Swindoll) and Walk Through the Bible. When he’s not traveling across the country as a Family Life Weekend to Remember speaker, he and his family reside in North Carolina . 1. What makes Playing Hurt stand out from other similar books? It’s a lot shorter! I started with the assumption that if men are going to read a book on marriage, they need to be able to finish it on a three-hour plane ride. Secondly, one can find many great books for husbands on “how-to” love like Christ, I found few on “why” men are called to love like Christ. You will find practical tips on how to be a better husband, but in truth, I’ve found that when men have the right motivation they’ll move in the right direction. 2. Why is Playing Hurt in sports a good analogy for marriage? But almost every man I know can answer the question, “Who is your favorite athlete who played hurt?” They may re-tell the story of Kirk Gibson, Michael Jordan fighting through the stomach flu in game 5 against the Utah Jazz, or though he’d never admit to watching women’s gymnastics, Kerri Strug landing that vault in the 96 Olympics. Whether it’s on the ball field, or on the battlefield, or in the boardroom, we men will dig deep and play through pain to get the win, save their buddy, or secure the sale. But in the arena of marriage, when our egos get bruised, our expectations broken, or our libidos starved, men seek the bench. We pout. We pounce in retaliation. But we rarely play through our pain for the chance at victory in marriage. 3. What is an "and" guy? Why are they important? What’s the craziest thing you’ve ever done? I bet it was dangerous. There’s a good chance it involved	the police. And I’d wager my son’s college education it involved other guys. Chances are, someone acted as your accomplice or as your audience. Living in Charlotte, home of NASCAR, where people spend five hours watching left-hand turns, I’ve heard a few redneck jokes—like this one: What are a redneck’s famous last words? Men do crazy things when other men are around. But they also achieve the impossible. First guys to conquer Mount Everest: Tenzing Norgay and Sir Edmund Hillary. First Americans to find a passage from the Mississippi to the Northwest: Meriwether Lewis and William Clark. First guys to fly a plane: Wilbur and Orville Wright. First guys to land on the moon: Neil Armstrong and Buzz Aldrin. What’s the common element between all those firsts? The word and. Crazy only requires spectators. But great missions, whether conquering a mountain or the moon or marriage, requires camaraderie. When you open the New Testament, you discover men (plural) on a mission. Even Jesus didn’t venture out alone. First thing he did after he started his public ministry? Surrounded himself with other guys (Mark 1:16–20). First time Jesus sent out the disciples? They went out like Noah’s animals— two by two (see Mark 6:7–13). When the first churches were established, they were founded by pairs of men: Peter and John (Acts 3–5); Barnabas and Saul (Acts 13–15); Paul and Silas (Acts 16–18). And is a powerful word. Who follows the and in your life? Who are your “and” guys? Walk through the letters of Paul and you’ll discover he never went anywhere without some trusted companions. Many men have buddies, but they don’t have “and guys.” Buddies get together and watch sports; “and guys” get together and share substance. Buddies say you deserve better than how your bride is treating you; “and guys” encourage you to sacrifice for your bride. Buddies encourage you to wife bash; “and guys” encourage you to beautify your wife. Buddies magnify your wife’s weaknesses; “and guys” magnify your wife’s strengths. Buddies gawk at other women; “and guys” help guard your eyes against other women. “And” guys rebuke, refocus, recharge, and remind us that the goal of marriage is not our personal happiness. They rebuke us when we crave the immediate over the eternal. They help us refocus on the mission of marriage: God’s glory—his fame and his name. 4. What is the Apostle Paul's "playbook for marriage"? What are the five guidelines to love like Christ? 1. Every husband needs the guts to love like Christ. 2. Every husband needs the glory of loving like Christ. 3. Every husband needs other guys to help him love like Christ. 5. Every husband needs the gospel that empowers him to love like Christ. 5. What is "game film," and how do you provide it in Playing Hurt? After every victory or defeat athletes analyze “film” from their game, match, race, or event to see what they can improve upon. Before the hand held camera captured everything in slow-motion, the pen captured stories. Throughout the book we go back through “game film” from victories and defeats in Scripture. Paul told a young protégé, Timothy, “All Scripture is breathed out by God and profitable for teaching, for reproof, for correction, and for training in righteousness, that the man of God may be competent, equipped for every good work.” We analyze what they did right and what they did wrong so we can be equipped for the game of marriage. 6. You say that when wounded in marriage, men tend to fall into one or more of these traps: persuade, punish, pity, or performance. How can husbands avoid these traps? How can they get out of them? 7. What do you mean when you say, “become a thermostat, not a thermometer”? If you’re like me, you can take your wife’s emotional temperature from about twenty feet away. When Jen is hot (I don’t mean ready to slip between the sheets with me), I know to seek out a cooler climate, perhaps out on the back deck with an iced tea. When she’s cold, I look for a warmer personality—like the TV—to keep me company. I’m not saying these responses are right. I’m just saying that’s what I tend to do. But Paul, in his playbook for marriage, calls us to set the emotional climate in our homes, not just measure it. (Ephesians 5:28), he’s encouraging us to cherish their emotional needs in the same way we cherish our own physical needs. If she’s chilly, it’s our job to warm her up. If she’s steaming, then we need to help her lower the mercury. In other words, the call to cherish means we have to engage when we’d rather shrink back. 8. How did your role as a pastor prepare you to write this book? I heard a pastor friend of mine say the most damning preposition in all of Scripture is found in Genesis 3. The snake seduced Eve with a fruit plate. Then she offered a bite to Adam who was “with her.” In other words when the snake slithered up to his wife, Adam didn’t grab a hoe and cut off its head, he just stood there. When it twisted God’s words, Adam didn’t argue, he just nodded his head. When Eve grabbed the fruit, Adam didn’t slap it out of her hands, he just watched. 9. Be honest: Who is your favorite athlete who played hurt? In marriage: my wife. In sports: I thought it was Dodger Kirk Gibson, but I just watched Soul Surfer with my family. I think Bethany Hamilton is a stud…ess. Step out of the shadows of self-doubt to live with a confident heart. We all have times when we feel like we’re not good enough, smart enough, or valuable enough. When we’re overlooked for things, passed by, or unacknowledged. Renee Swope has been there. Even with a great family, a successful career, and a thriving ministry, she still struggled with self-doubt. A CONFIDENT HEART shows us from God’s Word how we can find the security we need and the confidence we long for. Each chapter starts with Scripture, and concludes with a Scripture-based prayer. Also included are Bible study questions (you’ll want to keep a notebook and pencil close by as you read this book) and there is a chart with thirty-one promises that will help replace our most common self-doubts. A CONFIDENT HEART appeared in my to-read list at just the right time. There are several things I’m struggling with lack of confidence in, hurt over being over-looked and unappreciated, so I really could relate to some of the things in the book. I read this through for review, and didn’t take the time to study it or work through it for learning purposes. This is a book I will need to go back and pay more attention too. Recommended for you and any woman you know. $13.99. 330 pages. Jackie Donovan is pushing thirty and her loving relatives want to get her married off. But while Jackie would love to marry an honest, wonderful man, even more she wants to own a bed-and-breakfast on the beautiful Outer Banks of North Carolina. While she waits for the bed-and-breakfast to dream, she works as a journalist for the Lighthouse Views featuring local businesses. There is one property Jackie is considering for the bed-and-breakfast, including a fabulous old house located right on the ocean. Only things—the house seems to hold secrets and mysteries and the huge price tag. But then Jackie meets the handsome Davis Erickson who owns the house she wants. Jackie believes God is finally answering her prayers. But then she learns things that disturb her. Will Jackie risk her long-held dreams to discover the truth? HATTERAS GIRL is a chicklit, written in first person, and set in an absolutely charming area. I would love to visit this part of the country in person and see the Outer Banks. Jackie is the only character that we get to know in this novel, and while she was interesting in spots, in others she dragged—much like real people, but it made it hard to keep reading. I did figure out who the “love interest” was at the beginning of the book, and I wondered why Jackie was so blind and how and when she would open her eyes and see what I saw. If you like first person, present tense stories, then HATTERAS GIRL is a book to consider. If you prefer third person, past tense, then be warned. Otherwise, good story, great location. Love the back cover. Some yummy sounding recipes and discussion questions are included at the end. $14.99. 320 pages. Amish seem to know what they are doing when it comes to raising strong families. They enjoy life together, work together, play together, and even have strong extended family ties. What do they do differently than us? And how can we recreate their method in our busy lives? Suzanne Woods Fisher addresses that issue in AMISH VALUES FOR YOUR FAMILY. She tells a true story about an Amish family or someone well acquainted with the Amish, and then works in practical applications for us to implicate. That is followed by two quotes by Amish scribes in different parts of the country. I read through this book in one sitting, but it is meant to read slowly, so you can absorb the principles in the pages. I will be going back through this book again to fully understand some of the ideas, especially the ones that our family doesn’t already do. If you are looking for a simpler life, a closer family, and having your priorities straight, then AMISH VALUES FOR YOUR FAMILY is a book to pick up. You won’t be disappointed. $12.99. 190 pages. Giveaway -- push the button on the sidebar to enter. Rafe Easton is still in love with Eden, but she is off working with her father on a project that is of importance to her. Rafe has been approved to adopt a young boy, but he is leaving him with his mother until his business is taken care of, and he is married to Eden. But something is going on in the political scene. Eden’s father wants to quietly gift one of his daughter’s former suitors with a parcel of land—but why? As political tensions mount, some of the island’s most prominent families are faced with revelations that could cost everything—the country’s future and Rafe’s future. HAWAIIAN CROSSWINDS is the second book in The Dawn of Hawaii series by Ms. Chaiken. Readers will want to read The Spoils of Eden first as it will bring you up to speed on what is happening in HAWAIIAN CROSSWINDS. Set in 1892 and before Hawaii became a state. It is still ruled by the royal family, and so some real life people do make an appearance in the story. The historical Hawaiian history included in this novel makes it a must-read. $13.99. 350 pages. Chris Matlock is a wounded and weary soldier, healing after a period of time in the Veteran’s Hospital, and he decides to visit Jenny, a woman he met when they were both at the hospital. When he arrives to see Jenny, no one is home, so he falls asleep in the hayloft. Hannah Bontrager is worried an animal is in the barn, and she is frightened when she finds a man in the hayloft. She falls, but Chris catches her, hauling her up into the loft. But then he’s met by suspicion by Jenny’s husband, Matthew. A TIME TO HEAL is book two in Ms. Cameron’s Quilts of Lancaster County series, but it easily stands alone. Readers will want to read the first book in the series, A Time to Love, so they have an idea about Jenny and Matthew’s romance—especially as they play a major part in this story—and the third book A Time for Peace, coming in the fall of 2011. I enjoyed getting to know Chris—a wounded English man—and Hannah, a steady and solid Amish woman—and wondered how this relationship would work out—would he join the Amish or would she leave? That had lots of conflict right there. An enemy in Chris’ past just made the tension higher. There are several yummy sounding recipes included at the end of the book, and a fascinating interview with Barbara Cameron. Don’t miss A TIME TO HEAL. $13.99. 285 pages. ON THE PATH WITH GOD is a beautifully done gift book, hard cover, with absolutely gorgeous pictures in it, of pathways through woods and meadows, through cities and country-sides, and over bridges. It is lovely. And not only that, but Dr. Lutzer shares his wisdom through scripture and thought about how to walk close to God. He starts with reading epitaphs in cemeteries, moving on to scripture, and then mentioning Enoch who walked so closely with God that he didn’t die, instead he just walked on to Heaven with God. Wouldn’t that be something? This book is educational, inspirational, and pure meat for those hungering for God to speak to them. I loved the scripture references, the thoughts, even the applications, and I closed this book feeling as though God spoke to me. ON THE PATH WITH GOD is a gift book that isn’t going to be a gift. It’s going to go on my bookshelves to refer back to time and again. You’ll want to buy a copy for yourself as well as for a close friend. $15.99. 50 pages, hardcover. Helen Carlisle married young, giving up all her dreams to keep her highschool sweetheart from pouting. But now, Jim is dead from war related injuries, and still Helen isn’t free. She has to play the part of the grieving widow for her in-laws, her two-year-old son’s grandparents. The bright spot in her day is her volunteer work. Ray Novak loves to fly—but unfortunately, he’s just been assigned a position as a stockboy. He can’t think of a good thing about his new assignment, except for Helen. She is a spot of sunshine in his life, and he adores her son, Jay-Jay. Unfortunately, the Carlisle’s are encouraging Helen to date another man from a prominent family—and they are very against Ray, claiming he’s soft. When Ray and Helen are called upon to step out in faith, can they meet the challenges that face them? BLUE SKIES TOMORROW is the third and final book in Ms. Sundin’s Wings of Glory series. Each book stands alone, but they are all based on the three sons of the Novak family, so readers will want to read all three. Ray is a sweetheart, a pastor at heart, kind and considerate. Helen is playing a role, being who she believes she needs to be in polite society, but she only feels free around Ray. I hoped that Helen would be able to be herself and find happiness. The story is well-written, but it wasn’t quite so engaging as the first two books in the series. I didn’t grow to like Helen as much as I would like to, maybe because she was living a lie, but she seemed kind of flat. Still, this was an enjoyable read and I won’t hesitate to recommend it. Discussion questions are included at the end. $14.99. 427 pages. Thank you for being with us today, it’s good to have you. Thank you for giving me the opportunity to share about my experiences with the Amish and former Amish. You mentioned that you work with an Amish mission. What type of work do you do with them? I work with Mission to Amish People and Joe Keim. I voluntarily write the newsletter for the former Amish, Dee’s News. It’s my job to gather life stories (baby announcements, weddings, baptisms, opening of new businesses, etc.) to share in the bi-monthly newsletter. My husband also hosts a young men’s Bible study for the former Amish each Saturday morning in our home. It is led by Joe Keim. We also have informally “adopted” a former Amish young lady as our daughter. We represented her family last summer when she married because her mother is against her being in the English world and did not attend her wedding. Her father had died previously in a buggy accident. (The English is how the Amish refer to those who are not Amish.) We are also hosting a series of information days for the former Amish which include legal, medical, and dental professionals to help give advice on these issues. Many of the former Amish need doctors, dentists, and legal care once they are in the English world. What is the most interesting aspect of the Amish culture that you have observed? Hmm…that is a difficult question since under the surface of this outwardly simple lifestyle, there are layers upon layers of complicated decisions each Amish person has to make every day. I guess I would choose the Ordnung and how it is lived out in each church. Since it is up to each church and bishop to interpret the “rules letter”, there can be as many ways to be Amish as there are sects. Do you find the Amish friendly to the outside world? It depends on where you encounter the Amish. The groups that are most friendly are typically those who engage in commerce with the English, as in the tourist areas of Lancaster, Pa. and in Holmes County, Ohio. The area I live in has some of the most strict and reticent Amish groups. Tourist trade is not encouraged (though a few will sell farm products, baskets, baked goods and hand crafts from their homes). A friendly wave in passing may be all a stranger can expect to receive in these areas. Are the Amish as calm and serene as we often think they are? In many homes where the patriarchal system is in place (and this can be true in other groups, too! ), the home is as serene as the man in charge is. Some are blessed with kindly fathers and bishops, while others are not so blessed. In the less fortunate homes, abuse, in many forms, can often be found…if it is looked for. Wives and children are mostly at the mercy of the head of the home and church. What is the thing you dislike most about working with the Amish, if anything? I don’t work directly with the Amish, but with the former Amish. I think what often puzzles me most is the dichotomy between the innocence of their lifestyle and the sometimes frank and blunt manner in which they interact with each other. I am sometimes surprised by the “joking” that can seem cruel about physical aspects of each other. For instance, some of my former Amish lady friends can make disparaging jokes about another’s weight problems. The children often are not taught much about being careful not to point out flaws in one another. This always makes me uncomfortable when I hear it! It is almost an “Amish street-smart” that is startling to me, at times. What do you like the most? I LOVE how they persevere in spite of the most difficult life situations! And when the former Amish receive Christ’s grace for the first time, it is a beautiful and lovely thing to witness! Baby showers, weddings, baptisms with them always make me cry. My heart goes out to them at holidays when they miss their families most. I don’t know—it’s hard to choose one thing. I may not always understand where they’re coming from, but I love their willingness to work hard and start over from scratch. They truly are immigrants born within our borders when they come out of their Amish culture and join the English world. Are there any difficulties the Amish must overcome when interacting with nonAmish people? The former Amish I am in contact with leave their communities with no social security numbers, driver’s licenses, and often no birth certificates. They have to earn GEDs and learn to understand our government system. Many want better jobs than construction or farming work so they need to learn those skills. Many have 8th grade educations that are really equivalent to an elementary education so they often struggle with GEDs. Many have communication troubles since English is their second language. It really depends on which group of Amish they are brought up in. Those who are in the tourist trade usually fare better at the outset of leaving their Amish homes. If you read Amish fiction, hat bothers you the most—for example what is misrepresented or what part of their life gets left out? The most misrepresented aspect is the idea of rumspringen. I know it happens within an Amish community, but it is NOT encouraged! The parents would rather the teen join the church with no outside experience in the English world. They may “look the other way” if a teen goes against their wishes, but most Amish do not want their teens to experience rumspringen (or “running around”). The other notion that truly bothers me is the idea that all Amish are Christians. We have to get beyond the cute and entertaining aspect of the Amish community to discover if the truth of Jesus and His shed blood for our sins is really being taught! Wanting the Amish to entertain and fascinate us as Christians can be a sad and tragic mistake for those in the Amish communities we frequent who do not know Christ! We can’t allow the quaint lifestyle to deceive us into not realizing what a mission field we may have right before our eyes. Some Amish DO preach the gospel, but many are merely steeped in ancient Christian tradition and works. What traditions do they have that 'we' don't for holidays etc? They celebrate 2 Christmases. December 25th is for gift exchanges (gloves, hats, hope chest items) and fun. Old Christmas is celebrated on January 6. This is Epiphany, the fasting and sacred holiday. Some of my former Amish friends also fast on Thanksgiving morning until noon. Weddings are usually set for Thursdays or Fridays and usually in the fall, after the harvest season is over. Some communities plant celery in anticipation of a fall wedding. For some reason, this vegetable is used in dishes, as well as decoration at weddings. I believe it has something to do with old tradition of fertility, but the former Amish I know just told me they did it because they were supposed to and it is tradition. (That is a common answer for many such questions I may ask!) My book, The Miting, includes a chapter with an Amish wedding for one of the characters. I added a lot of detail about that special day. What are the similarities and differences between your work compared to a non-Amish ministry? I would guess that I have a similar experience with the former Amish that any missionary would, except we live right here in America with them. The same teaching and life-style coaching, as needed, the same support that other’s have to give. But I would guess the differences would lie in the naiveté and innocence of many of the former Amish. Though they can be blunt and lacking of some social skills, most are very trusting of those they should be careful of. It is most difficult for me when I don’t understand what the young ladies, for instance, may perceive as a typical Englisher way of doing something—when, in fact, they have it wrong entirely! I must also be careful not to intrude where it’s not wanted or appear bossy. With all the control they have had in their growing up years, few of them want to feel that “thumb on their necks” ever again. Can you give us a blurb about your book your agent is marketing? My book, The Miting, is the sum total of the experiences of several of the young ladies I have grown to know and love while working with Mission to Amish People (http://www.mapministry.org/). I have written their stories, and formed it into a novel about a young lady who becomes a born-again believer and how that decision leads her to having to leave her Amish community and home. The book follows her into the English world and then back again to the Amish. It is quite typical for many former Amish to go home and try once again to live Amish. Some stay, but many, especially those who are considered born-again, do not. It is too hard for them put the yoke of works back on their necks. My book, which I hope is the first of a three book series, follows my main character, Leah, through these changes and decisions. Terry Burns, of Hartline Literary Agency (http://www.terryburns.net/CLIENT_LIST.htm), is representing me. Is there anything else you’d like us to know? I would really like to stress how much the Amish and former Amish need our prayers and support. MAP (Mission to Amish People) can help facilitate the prayers and support for those in the Amish community and those who have left, as well. I also have a blog on which I have links to Mission to Amish People and my agent, as well as my writing profile at Faithwriters.com. On my blog I write about my life journey among the former Amish, as well as my family, my work and whatever gets my attention for the day. It is most definitely an eclectic mixture of who I am! I would love to have your readers stop by My Heart’s Dee-Light to say hello.(http://deeyodersblogspot.blogspot.com/). Thanks again for having me here, Laura! UNCOVERED is a book that shares the secrets of understanding your husband and making your marriage your top priority. Ms. Davis suggests using biblical wisdom, practical sense, and a bit a female charm. Ms. Davis also had a bunch of male interviewees she calls “The Male Room” that answer questions regarding each chapter. Some of the answers are really funny and others really get you thinking. I’ve been married twenty-five years, but some of the chapters really spoke to me. Some of the years (probably most of them) I’ve been guilty of putting my family first ahead of my husband. Well, my children still need attention. We have a large family and the youngest one is still very young. But I am going to start paying more attention to my husbands needs. Every married woman has room for improvement in their marriage. And this book will help to make even a good marriage better. Ms. Davis says great, if you even follow half of the suggestions. UNCOVERED is a book for any married woman – to help her rediscover the woman her husband married and be one “hot mama.” $12.99. 167 pages. Roxanne was raised to be a genteel Virginia woman, but when her mother dies and her fiancé dumps her, she travels to the wilds of Kentucky to reach a remote fort where her father is stationed. But when Roxanne arrives, she is crushed to learn that her father had been killed in the line of duty. Colonel Cassius McLinn promised her dying father he’d take care of Roxie, still, the last thing he expects is to find her there in the Fort—especially since he’d assumed her safely back in Virginia. But he can’t help but be attracted to the lovely Roxie. Still, he knows their love is doomed—especially once she learns the truth of her father’s death. Then the war takes a dangerous turn. There is a dangerous person sequestered in the fort, trying to kill the Colonel. Worse, Cass’ own brother is leading the attack against him—on the enemy’s side. The fort is a-buzz with intrigue. But will Cass and Roxie even live long enough to find love—or will she forgive him for the horrible secret he carries? THE COLONEL’S LADY is the second book I read by Ms. Frantz, but it won’t be the last. I loved Courting Morrow Little and looked forward to reading this book. I was very happy when it appeared in my to-be-read pile. Roxanne is a charming heroine, lost and confused, but caring and considerate to the others with her in her party, and very brave when the situations arose where she needed to be. Cass was the typical tall and handsome hero, but while he was an officer and a gentleman, he was also dangerous, feared, and precise. I couldn’t help but fall in love with both Cass and Roxie and even some of the secondary characters in the book. While traveling on a candidating trip, I had an opportunity to visit one of the historical military forts in person, and I found Ms. Frantz’s descriptions of them quite accurate. I could almost see the officer’s housing, the cooking house, and the barracks. If you are looking for a good historical romance, then be sure to pick up THE COLONEL’S LADY. You won’t be disappointed. $14.99. 408 pages. Three hope-filled Stories about second chances, trusting your heart, and the power of forgiveness. Healing Hearts: Naaman Lapp left his wife, Levina, after 31 years of marriage. Now, eleven months later, he is home, wanting to take up where they left off. Levina allowed him back in her home, but it’s going to be some time before she allows him back into her heart. What can Naaman do to possibly win back his wife’s trust? A Choice to Forgive: Lydia has built a life for herself when her fiancé Daniel vanished one Christmas eve. She married Daniel’s brother Elam, and they had three children. But now Elam is dead, and Daniel is back, and he’s asking Lydia for forgiveness and a second chance. Lydia doesn’t believe she’s capable of providing either. How can she go back to normal life with her long lost love as her neighbor? A Change of Heart: Leah doesn’t care anything about the usual domestic work that an Amish woman does. She only cares about writing. Her daed is at his wits end what to do with her, when an ex-Amish Angel comes into Leah’s life. What will it take for Leah to find her way? Each of these three stories was previously published by Beth Wiseman in another novella collection: An Amish Gathering, An Amish Christmas, and An Amish Love, and now they are together for the first time in an anthology entitled (appropriately) HEALING HEARTS. I enjoyed each of these stories, and enjoyed reading them again the second time just as much. I love the cover of this book. I’m not sure which of the three stories I like the best—it was a toss up between A Choice to Forgive and A Change of Heart, but all three were good. If you like Amish fiction and the ease of novellas, then HEALING HEARTS is a book to consider. Discussion questions, a glossary, and some recipes are included. $15.99. 419 pages. Do you know what you believe about your faith? Do you know why it’s true? 1. Does it really matter what you believe as long as you have faith? 2. Are there errors in the Bible? 3. Was Jesus just a good teacher? 4. Can His resurrection be proved, or did he ‘stage’ His death? Josh McDowell and Bob Hostetler use funny (and true) stories to expose common myths about God, Jesus, the Bible, and life, so you can truly know what you believe and why. I sat down with DON’T CHECK YOUR BRAINS AT THE DOOR when I took the girls to the pool for an hour, and by the time they finished swimming, I’d finished reading the book. Set up in short sections, readers can easily read through a myth in moments, then look up the scripture references included and answer the questions that are at the end of the section. Handily arranged so you can search by topic, you can find whatever lie that you’re being exposed to (or doubting) and find the truth for yourself. I highly recommend this book for teenagers facing ridicule for their faith to adults. $12.99. 191 pages. Don't Check Your Brains at the Door gives teens answers that make sense, even for the toughest of questions. Internationally known defender of the faith Josh McDowell and co-author Bob Hostetler offer clarity laced with humor to expose common myths about God, the Bible, religion, and life to show how Christianity stands up to the test of fact and reason. Teens will be better equipped to stick with their faith as they begin to understand why they believe and why it's important to make a lifetime commitment to Christ and the church. Bob Hostetler is an award-winning and best-selling writer, editor, pastor, and speaker. His books include Don't Check Your Brains at the Door and The Bone Box. To celebrate the release of their new book, Josh McDowell and Bob Hostetler have teamed up with their publisher, Thomas Nelson, to give away a brand new KINDLE! Don't Check Your Brains At the Door answers many of the faith-related questions Christian youth face. It challenges young readers to test gospel truths found in the Bible so they can learn to give an answer for their faith as they mature into thinking adults. A great resource for teens and college-age. Bring your friends and join the fun on August 18th at 5:00 PM PST (6 PM MDT, 7 PM CDT, & 8 PM EDT). •Why are apologetics important for teens? I took my son and daughter to Israel when they were in high school. After ten days of experiencing the land of Jesus and the Bible, I asked my son what the trip had done for him. At the time, he was a pretty moody sixteen-year-old, and I really didn't expect much of an answer. But he surprised me. He fastened his gaze on me and said, "It's real to me now." That's what apologetics can do for a teen. Obviously, not everyone can travel to Israel, but anyone can discover the utter reality of the things we believe, by exploring the evidences for those beliefs. •What's the biggest apologetics question/s teens face? It's really hard to narrow it down to just one "biggest" apologetic question (in my novel The Quest, coauthored with Sean McDowell, we tackle six "biggies"). But if you force me to answer, I'd have to say the biggest issue is the problem of suffering and evil in our world and in our lives. Every teen craves an answer to the question, "Does God exist and does he care?" •How can adults use this book? There are many ways adults can use this book. Some parents will buy it and hand it to their teen, or use it for family devotions. Others will be a little more sly; they might just leave it under a pile of laundry in a teen's bedroom, hoping the kid will find it and start reading. I've heard from Sunday school and public school teachers who read a chapter a day as class devotions; I've even heard from a college professor who did the same! Youth pastors can challenge their students to read it together. Some give it as gifts or use it as Christian camp curriculum. And I've had many adults tell me that they've gotten as much out of the book as their teens! •What makes Don't Check Your Brains at the Door different from your other apologetics books? Why do you think teens will read this book? Much has changed in recent years in the way our kids access and process information. Television, movies, video games, the internet, and social media have drastically affected our kids' attention spans and learning styles, among other things. Don't Check Your Brains is a unique resource in that its short, humorous, engaging chapters are perfect for a "Twitter generation." Books like More Than a Carpenter and Evidence That Demands a Verdict are tremendously helpful resources, and our hope is that many teens, being introduced to apologetics in a truly entertaining way, will go on to further investigate the evidences for their faith in such books as those. But Brains provides an introduction and foundation that is accessible to every teen. •How did the two of you collaborate to write this book? When Don’t Check Your Brains at the Door was conceived, I was the editor of a national magazine for teens. I wanted to find a creative and engaging way to counter some of the myths that youth encounter every day—in the media, at school, you name it. So I sent off a proposal for that sort of book to several publishers, and one of them phoned me to tell me that they were under contract with some guy named Josh McDowell for a very similar project, and to suggest that I consider partnering with Josh in writing this book. Before long, Josh and I were exchanging research and chapter drafts through the mail, and together we crafted Don’t Check Your Brains at the Door. We wanted to do something that had never really been done before: take evidential apologetics to a teen audience in a way that both entertained and informed. We wanted to make people laugh….and think. We think it does that, and to such a degree that we’ve heard from all sorts of people, from teens to parents of pre-teens to college professors, that they have used the book in many different ways—for family devotions, for college class devotions, for Christian schools, youth groups, and more. Does your to-do list have footnotes? Are you imprisoned by the joy-sucking dully-funks? If you answer yes to either of these questions, then maybe it’s time for a healthy dose of truth gift-wrapped in humor. Debora Coty addresses common issues women face in her book TOO BLESSED TO BE STRESSED, and laces the biblical and common sense advice with strong helpings of wit and practical steps they can take to arrive at healing, refreshment and revitalization. If you are stressed, then definitely pick up a copy of TOO BLESSED TO BE STRESSED $9.99. 220 pages. Debora has lots of fun stuff going on for the launch of her book - be sure to check out Debora's series of Stress-Buster videos at her website: www.debcoty.com. She’s also hosting a photo caption contest on her blog for a chance to win a copy of Too Blessed to Be Stressed. To celebrate the release of her latest laugh-out-loud book, Too Blessed to Be Stressed, Debora Coty is hosting the Too Blessed to Be Stressed KINDLE Giveaway! swapping funny stories, handing out some decom-stress tips, and giving away tons of great stuff! (Chocolate, books, and more!) Hope to see you there. Bring your friends and join the fun on August 25th at 5:00 PM PST (6 PM MDT, 7 PM CDT, & 8 PM EDT). Also - be sure to check out Debora's series of Stress-Buster videos at her website: www.debcoty.com. Also, be sure to check out the photo caption contest she's running on her blog for a chance to win a copy of Too Blessed to Be Stressed. To win a copy of Candee's book, answer her question at the end and leave your email address. One winner will be chosen. Void where prohibited by law. Life is a journey full of twists and turns … and sometimes roadblocks and detours. Yet, there is still hope because God is in control and He has plans for our future. In both my non-fiction and fiction writing, I want to offer readers encouragement for their journey. Besides when you came to know the Lord, what is the happiest day in your life? Oh, so hard to choose. My wedding day would be at the top of the list. (I’d add the birth of each of my three children but that was more relief than joy since we had complications every time!) Close contenders would be the days my daughter first walked … and talked … and started reading. Everything else seems to pale in comparison. How has being published changed your life?I’m busier than ever with promotion and marketing added to my already crazy schedule. Once published, there is no coasting! However, I’ve also found the confidence to officially say I am a writer, I am a professional, and I can somehow do this again and again. What are you reading right now?In addition to my Bible, I’m currently reading the Brides of Bonneterre Trilogy by Kaye Dacus. Followed by the next book in my toppling to-be-read stack. I’m currently brainstorming a contemporary romance featuring a burned-out Certified Nursing Assistant and a brawny handyman at a mountain lodge. Then again, I’m also toying with the story of an heiress and the manager of an estate auction company. Whichever one takes over my creative energy is the next one onto paper. Hmm. Tropical, isolated, beachfront cabana, stack of books to read, no wake-up calls. In my dreams! Real life includes a family who wants to go do stuff like amusement parks and swimming and being dragged on a tube behind a boat. This book is nonfiction, so doesn't apply, but for my fiction I choose settings close to where I live since the research trips are convenient. However, I try to boost tourism by showing off their highlights! If you could spend an evening with one person who is currently alive, who would it be and why?Sarah Palin. I’d love to learn more about her life raising a special needs child while balancing work and family. I used to teach high school chemistry with an Elementary Education degree/license. I live with chronic fatigue syndrome. At age 15, I won my age category in a half-marathon race. Not that I have a lot of free time, but I enjoy catching up on the family photo album scrapbook and crocheting afghans. What is your most difficult writing obstacle, and how do you overcome itWith three kids and a day job, finding time is my biggest obstacle. Specifically, finding time where I still have at least some creative energy left to give. In order to overcome this obstacle, I make a list of small goals for each week, squeeze tasks into the blocks of available time, and give up television. I also try to get my thoughts in order earlier in the day or while doing other things so that when I can sit down to write, the words will come quickly. Read a lot. Write regularly (even if it’s only a page). Learn continually. Never give up. Making Lemonade: Parents Transforming Special Needs is a project born out of my own experiences as the parent of a child with a rare genetic syndrome (CdLS) and the desire to share what I’ve learned with other parents. Because, when life gives you lemons, how you approach, process, and transform them makes all the difference. Especially for parents facing the sour experiences of raising children with developmental, behavioral, and/or health needs. Mirroring the steps of a recipe for making lemonade, this book covers the pucker reaction, gut-wrenching juicing process, adding the sugar of hope, watering down with life, adding other fruit (siblings), stirring, the pitcher of support, chilling, sipping, and sharing. It includes practical strategies and the stories of eight families (including mine) facing a wide variety of issues. I want readers to realize that they are not alone in the journey. Their feelings are normal and there is hope for the future. In fact, one reviewer called the book “a virtual support group” and I think that says it best. Is there anything interesting about this book that you want us to know? Over the past four years of trying to find a publisher, I was told that my audience was too small. It was suggested that I take out (or really tone down) the God and faith element so that the information would appeal to more people. I chose not to because this book without God in it is like lemonade without sugar. Not very appealing or satisfying at all! What lemons in your life are you transforming? On a stormy night on the Sunshine Skyway, a five-mile bridge spanning the bay from St. Petersburg to Bradenton, the lives of three families intersect. One family is ravaged by a child’s heartbreaking news, a marriage is threatened by a flimsy façade, and a college student is burdened by fear and self doubt. How will light come to these tragic stories? Unfortunately, this isn’t the worse. As the families start to cross the bridge, they don’t know that the bridge is collapsing—and these families’ lives are changed…forever. BRIDGE TO A DISTANT STAR is based on a true story, an incredible tale of three families caught in a terrible tragedy. This is the first book that I’ve ever read by Ms. Williford, and I found her to be a very talented writer. Her writing is impeccable, and I couldn’t find any fault with it. The characters were very realistically developed, and stories based around real life are always fascinating. However, this book was very heavy. I usually can read through a book in a matter of hours, but BRIDGE TO A DISTANT STAR took over a week, it was just too much to absorb in a short time. This story is one that will stay with you, the characters ones you will remember long after you close the pages of this book. Particularly fascinating are the pages at the end of the book in “Afterwards” where there is a conversation with the author, the true story behind this book, and more. $14.99. 371 pages. Peyton Aldrich’s father is an Army colonel, specializing in Army intelligence. His work is top-secret, so he can’t even discuss it with his own family. Nevertheless, Peyton idolizes his father and someday wants to be a Ranger, just like his dad. When Peyton was out wandering around, he met two other boys his age and they agree to pretend to be Rangers in training. Since Peyton knows a little about it, he becomes the leader. But then they overhear some top-secret plans—and they may be forced to go on high alert to save the base, and Peyton’s dad’s job. 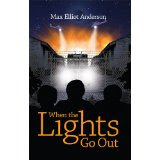 WHEN THE LIGHTS GO OUT is the latest in Max Elliot Anderson’s books for reluctant readers and it’s just as exciting as the first. This particular book is commemorating the 10th anniversary of 9-1-1, when terrorists attacked America, killing thousands of people. Children need to remember this event, and remember that they can be instrumental in protecting America from this happening again. If you are looking for a book for your reluctant reader then WHEN THE LIGHTS GO OUT or any of Mr. Anderson’s books will be excellent to pick up. Highly recommended. $13.99. 163 pages. In 1918, the Great War had come to an end. Germany is still struggling to get back on it’s feet. Christophe Brecht has fought for four years for his country, and now he’s lost. Nothing at home is as he remembers. His parents are gone and his sister has left for America. So, when he’s offered a job by family friends to travel to Munich to find their daughter, Christophe agrees. Annaliese Duray has grown to be headstrong, idealistic and beautiful, and right now she is on the front lines of the city’s political scene, fighting to give women and working-class a voice in Germany’s new government. As the political upheaval ignites in Munich, so does the attraction between Christophe and Annaliese. But a Berlin army threatens to squash everything Annaliese is working for—and she is forced to choose between love, loyalty, and her life. Maureen Lang has long been one of my favorite historical authors, and SPRINGTIME OF THE SPIRIT didn’t disappoint. Full of political tension, the characters are forced to make major decisions about everything, because it all affects their lives. Tightly written, the story holds the readers attention, making them care about the characters and the decisions that they make. If you are looking for a good historical romance then SPRINGTIME OF THE SPIRIT is a book to consider. This is much more than a fluffy romance—it is full of sustenance. It is the third book in Ms. Lang’s The Great War series, but it easily stands alone. An author’s note is included at the end of the book. $12.99. 324 pages. Gabi Bertarrini has just returned to modern times from the fourteenth century where she left her heart. She finds her mother, but they are in trouble for disturbing an excavation site where her mom had been hoping to work. Desperate to convince her mother of the truth, Gabi and her sister Lia take their mother back to the past, to a dangerous period that made Gabi feel more alive. CASCADE is the second book in Ms. Bergren’s The River of Time series. I didn’t read the first book in the series Waterfall yet, though it is in my to-be-read pile. I recommend reading the books in order as I started out CASCADE thoroughly confused, thus it took me awhile to get into the story. Gabi and her sister Lia are thoroughly modern girls, thrust back into medieval times. The customs and lifestyle is thoroughly unfamiliar to them, and the danger is high. Especially when, somehow, the sisters did something in the first book to get the enemies attention—and now they are wanted. The story is engaging, the attention to detail is good, the characterization great. I enjoyed the story and am looking forward to going back to read Waterfall so I could find out what happened first! If you like time travel, medieval, or historical books, then CASCADE is a book you won’t want to miss. Discussion questions and author’s notes are included. $9.99. 399 pages. Lilly Margolis is a door-to-door saleswoman, trying to sell cosmetics—though to the upper class they are cheap, not-worth-the-money junk, but to the working class, they are overpriced, luxurious items they can’t afford. Still, one very kind rich woman bought the entire contents of her suitcase, but that doesn’t stop Lilly from quitting her job. After a roaring night on the town, fun-loving flapper, Lilly twists her ankle and falls in the backyard of the same wealthy lady who bought her wares. But this home is still enduring the effects of the Great War. Cullen Burnside is a disillusioned and disfigured veteran, and his mother Betty Ruth, suffers from dementia. Lilly is a light in Betty Ruth’s day, rejuvenating her and Cullen’s sad, disconnected lives. But—Lilly is hiding… and when Cullen insists about returning her to her faraway home, their budding friendship seems destined to die on the vine. I grew up reading Grace Livingstone Hill books and in those books, flappers were always portrayed as the “bad girl” and definitely not the heroine. So, I was a bit surprised to find the heroine in LILIES IN MOONLIGHT is a flapper. Lilly was someone the more conservative folks frowned at, dressing in short, fluttery dresses, and wearing the short bobbed hair, but still she harbored a hurt spirit that made the reader care. Cullen was a more confusing character. It took quite awhile for me to get him. He didn’t approve much of Lilly at first, but then… neither did I. He was a man of few words, very protective of his mom, and even more so of himself. LILIES IN MOONLIGHT is full of hurting, flawed characters, but ones that you grow to care about. It was hard for me to wrap my mind around a flapper heroine. But this was a good read and well-written. Discussion questions are included at the end of the book. 3.5 stars. $14.99. 344 pages.